This contest is now closed and the winner announced. Closes December 20th - just leave a comment with your email address for a chance to win (Details below). Thank you Sassy Brit for having me on your blog to talk about my debut novel, Cleanse Fire. Captain Derac Vidor has served Kinir for nearly twenty years. It’s his life, his blood, his soul. And then his Commander betrays everything Derac holds dear. Now he has to focus on his own life and his team instead of saving the citizens of Kinir. Now, today is Remembrance Day or Veterans Day depending on where in the world you live. 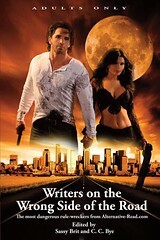 So going with that theme, I'm going to tell you the story behind my book. I'm sure you're wondering what a fantasy author - or a fantasy book - has to do with honoring soldiers. Simply put, I'm a proud Army Brat. 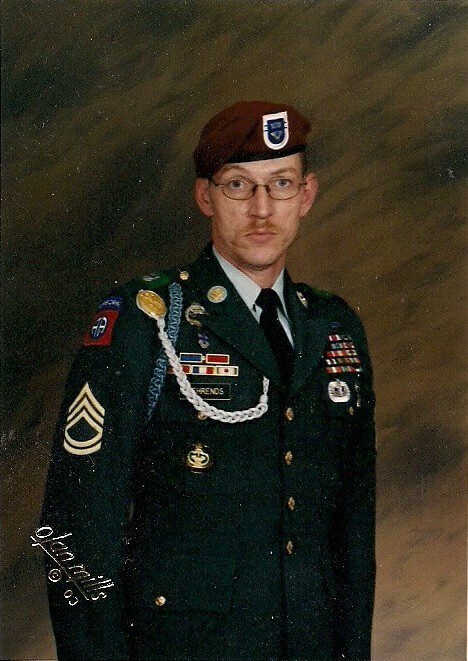 My Dad served 20 years, 1982 - 2002, in the U.S. Army, retiring with the rank of Sergeant First Class. He was as a Drill Sergeant for a few years, training fellow infantrymen where he earned the nickname "The Hurricane." His service took him around the world to places like Korea, Panama, Egypt, Israel, Germany, and more. I asked him once what he felt like serving and he told me "privileged." Now, the thing about my Dad, as you can see in the picture here, he looks very serious - and almost scary really. But the thing is, he would get down on the floor with me and my sister when we were little girls, and play Barbies with us! I'm definitely a Daddy's girl and I wanted to honor him with my writing. Even though I'm a fantasy writer, I had the idea a few years ago to write a story about his career and his life. He was great and answered all the questions I had, even though I'm sure some of them were hard to answer. I began writing the story and got about a page into it when I realized there was no way I could do it. I didn't think I could capture the feelings, the emotions, he felt during that time in an accurate way. I would hate to write a story to honor him - and all soldiers - but only end up ruining it completely. So, I put the story down for a few years. When NaNoWriMo came around in 2009, the story resurfaced in my brain again and the urge to write a story to honor soldiers was still strong. 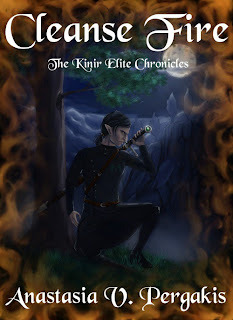 But this time, the story came to me in a different way - as a fantasy novel. The story as it exists now, is completely fictional. 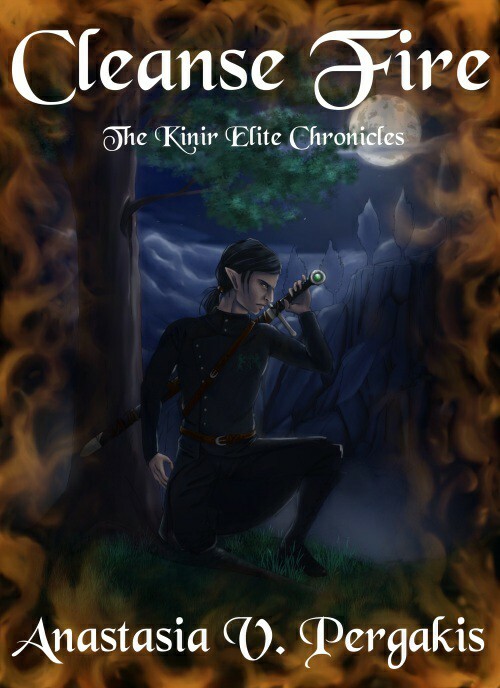 The characters in the book are soldiers, granted they're elves, but soldiers just the same. And they are dedicated to their country, just as soldiers in our world are dedicated to theirs.I want to honor my Dad - and all soldiers. Because of that, I'm donating a portion of the royalties from Cleanse Fire, and the books to follow in the series, to the Wounded Warrior Project. This organization helps wounded soldiers and their families heal after they return home. You can learn more about them and read stories from soldiers they helped at their website, www.WoundedWarriorProject.org. It is an American organization, but it is my hope that my book honors soldiers across the sea as well. The Wounded Warrior Project is merely the beginning! This is just my way of saying thank you to the sacrifice and dedication our armed forces give for our freedoms. I was lucky that my Dad was not killed during his service (and he still lives to this day). But there are so many that come home severely wounded, or not at all. I want my book, even though it its fantasy, to tell soldiers that their sacrifice means something, that we know how important it is, and that we are eternally grateful. In honor of Veterans/Remembrance Day, I’m giving away an e-copy of Cleanse Fire! Leave a comment on this post to enter into the random drawing BY December 20th. You MUST leave your email address IN the comment so I can contact you when you win! All commenters will also be added to the drawing for a chance to win a signed hard cover version of the book when it releases December 21. (My Dad's birthday by the way….). Thank you so much SassyBrit for having me a guest today! A note to everyone: Today, Cleanse Fire is just .99 on Smashwords! Half of all profits from sales today I'm giving to Wounded Warrior Project. What a wonderful insight on how this book came about. I too was a military brat and I think what you done here is great. Congratulations on the upcoming new release, I wish you many sales. What an awesome way to honor your dad & all the other men/women who put their lives on the line everyday, so that we are all safe.